O'Donnellan & Joyce auctioneers is offering for sale this superb four bedroom detached residence offering space and style in abundance both internally and externally. 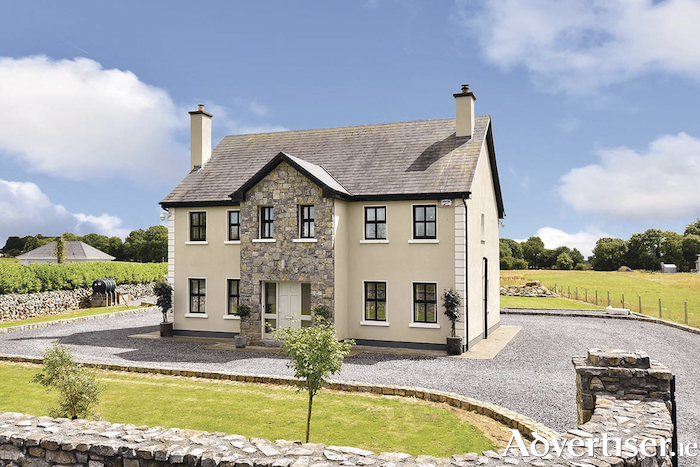 Located at Moneyteige, Craughwell, Co Galway, this property offers tranquil and scenic living close to all of the amenities and services that one would require for modern family living. Situated on a 0.7 acre site in the quiet rural landscape of Moneyteige, this property is ideally located close to Oranmore, Craughwell, and Athenry. It also benefits from the nearby motorways to Dublin and Tuam/Limerick. Only 20 minutes from Galway city, this property would suit a young working family looking to settle in a quiet rural setting with ease of access to all major facilities in the area. The villages of Coldwood, Craughwell, and Oranmore offer schools, shops, and sports and recreational facilities, while Athenry and Galway offer employment opportunities in abundance with high tech engineering and biomedical device companies thriving in these areas. Surrounded by landscaped gardens, limestone walls, and manicured lawns, this residence offers every modern feature that one could desire. With a large welcoming hallway, a family lounge room, and a second sitting room with access to the beautifully appointed kitchen and dining room, this property offers great living space throughout. A separate utility room with guest wc completes the accommodation on the ground floor. On the first floor it is apparent that meticulous attention to detail was employed by the current owners who have spared no expense in creating a wonderful family home environment. A large landing with carpeted flooring and dual PVC double glazed windows with luxury curtains and blinds create a bright and airy communal space. The first floor has four large double bedrooms with two en suite bathrooms and master bedroom offering a walk-in wardrobe. The main family bathroom with feature tiling and freestanding bathtub completes the accommodation in this well thought out residence. Featuring a Nest central oil fired heating system, radio controlled electric gates, and a block built shed with overhead door, this high tech residence would be an ideal starter home for any young couple looking to raise a family in a safe and quiet rural environment. This property would also be an ideal investment property due to its quick links to the city centre and surrounding towns and villages or as a holiday home or retirement residence due to its low maintenance characteristics and high tech living aids. Viewing of this one-of-a-kind property is highly recommended and guaranteed not to disappoint. The BER is B2. Asking price is €375,000. Page generated in 0.1169 seconds.